Curently no buffalo available only crosses. 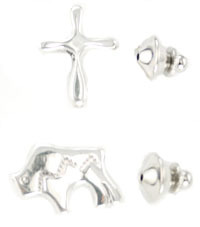 Assorted cast sterling silver tie tacks. **Now available in stamped bear or a howling wolf. *** Cross measures about 7/8"L x 5/8"W. Buffalo measures 7/8"W x 5/8"L. Navajo crafted by Pauline Nelson. Bear and wolf will measure similar to the cross and buffalo. No cross or buffalo available at this time. Choose design when ordering.